There are few things that the Home Studio hobbyist doesn't want in their arsenal. However, if we had our way we'd be over stocked and packed into a tiny corner surrounded by gear. Yet, of all the things we want, there are truly only a handful of things we truly need. I am a big fan of lists, and a huge fan of simple. So, I have compiled a list below of things that every Home Studio, regardless of their genre or size, really needs. Also, if you have listened to the podcast at all, you would know that I recently made a confession. That being, I am a "cheap-skate". I love FREE but cheap is my second favorite. So included in the list are links to good products at a cheap price! If you have ever heard a recording without one, you remember it, but it's not a good memory. The plosives are annoying, unprofessional, and unable to be removed from a recording. Whether your artist is male or female, if they are laying down a vocal take, this is a must! Click this pic below to get a great pop filter at an amazing price! When it comes to hearing the nuances of the acoustic, and making informed EQ decisions, I love to reach for my headphones! In fact, I even do quite a bit of mixing in my headphones! Yes, I said that. In fact I covered this in a previous post here on the site. (Mixing With Headphones) I personally use the Audio Technica Art Monitor Headphones but am really wanting to get my hands on these! Getting your music into a digital format has never been easier for the Home Studio hobbyist. There are so many options, and most are very reasonably priced. I personally use the BOSS BR-800 as it has so many options and is loaded with extras, but there are cheaper alternatives. If you are only recording yourself, this item should suffice. Now I have been rather partial about this mic, but I am just so sold on the quality and versatility that this mic brings to the Home Studio that I can't quit plugging it. It is cheap, it sounds great on a wide variety of sources and it is USB. When your first starting out, this mic will get you up and running quickly! Four polar patterns, excellent sound quality, gain and volume knobs, and latency free headphone monitoring are just a few things to name. I highly recommend this mic! In fact, I used this mic to record all of the vocals and all of the acoustic guitar on my first album! I hope this helps! 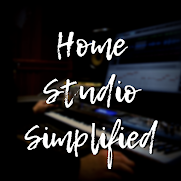 If you'd like more great tips like this and videos related to the Home Studio please sign up below for my bi-weekly email list!